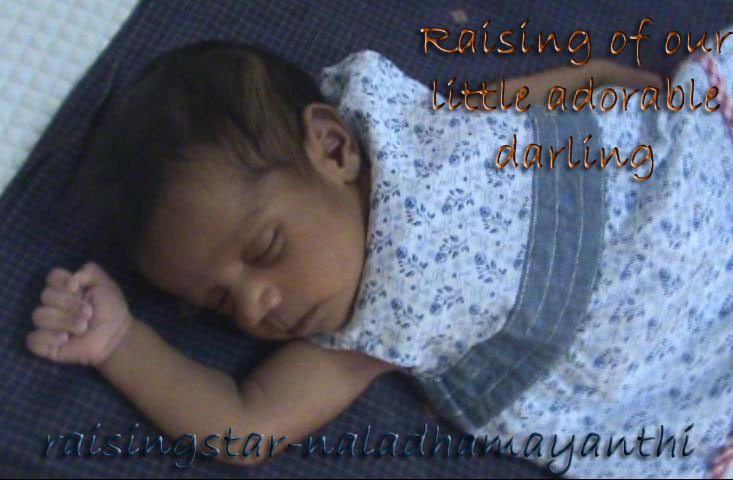 Raising of our little adorable darling: Is it really a big thing? Is it really a big thing? When I think about nursing, it is an intimate feeling that fosters a strong bond between me and my daughter and I find it difficult to let that go. YES, Of course, even though I wanted to wean, yet still feel uneasy about it, may be kinda of guiltiness. But night waking for almost sixteen months would come to an end. Hmm... Amma wants to break it.... But I'm not ready!!! I wanted to register one thing here in high tone and VERY seriously. I wanted to fulfill the needs of my daughter ahead of what OTHER people might think. Everybody (mainly OLD ones) feels that feeding a baby more than 11 months is a sin. They simply tell me the reason as that it would be tough to make the baby wean once baby start realizing what happens with her mother. I felt tough to continue nursing, when every one else in the family frowns on my choice. No one can come in between me and Amma! But as I said earlier I felt it is more important to fulfill my baby's needs and moreover I wanted to build a stronger bond between me and my baby. That is the only time we spent together without anyone's interruptions. I know each and every inch of her body, even I could find any tiny marks on her. I feel that is the time for only mother and baby. When coming to the moment of weaning, I prepared very well and my daughter seems not much interested in feeding, but wanted to feel my closeness. I gradually decreased the counts and it was only bed time I fed her and she started getting the habit of waking up in the midnight and asking for "B". I don't know either it is "B" or "Bee". She has named like this for the nursing process. :-) I have to tell how Thamizhini named like this. I used to have pillow for support when I nurse her. And that pillow has nice flower design on it. Thamizhini is always fond of flowers and she initially called "Poovi" for Poo. Later it became a habit for Thamizhini to get that pillow for feeding and she says "Poovi". If Nalin tells Thamizhini to go and have "ungaa", she first go and gets that pillow, then comes to me by saying, "Amma Poovi". And somehow that Poovi turned in to B as short. Back to story, She wakes up and simply lies down and would be counting the stars on the sky. And sometimes she simply will not sleep for couple of hours and asking me to get up and play with her. After all these kinda disturbance, I thought, it would be better to stop feeding, so that she would get full stretch of sleep in the night and even me too! Amma, I'm sad and I need you always. And we also had a plan to go for a relative's marriage in our native. I would say that helped a lot, becoz' in the new environment, she totally forgot about nursing. Sometimes I used to say her that "B" was stolen by Kakka when she asks me about it. It took totally of two weeks to wean from me and I would say that first five days were tough. The remaining days left unknowingly as we were in our native and even Thamizhini did not get any clue about nursing. I was extremely happy that I passed another big mile stone in parenting. I was totally shocked and did not know what to do. I woke nalin up and told him to take Thamizhini out to show two helicopters. Yes, there were two helicopters flying on the sky. I have known that nothing will work out, except helicopters, since she was bored of Kakka, Pura and all! Somehow she forgot about "B" and started playing. After thinking for a whole day, I came to know that Thamizhini is fond of B, gets reminded about nursing by seeing the pillow and not by seeing ME. :-D Great Insult.. Grrr.... Hmm... so, on that day night I simply hid all the pillows, (yes, not only hers! I tried this some time back. If i hid her pillow, she gets other pillow and comes to me :P) and we slept without having pillow. At last I forgot everything and sleeping nicely! And to my surprise, she did not get up in the middle of night and we continued this setup for one more week. Even sometimes she somehow gets reminded about B and asks me. I started telling that "B Kakka thookitu poyiduchu", I hope she was satisfied with the answer as there were no pillows on the bed. I could also wean Sruthi only with my mother's help when she was 18 months old. Sure kids enjoy closeness with mother more than feeding from us. Sreenidhi is also getting adamant these days, don't know how to wean her and when to? Yeah Gays! Really. And I feel ideal time to wean is 16 - 18months. Because, Thamizhini started knowing everything at her 18months.